Lefebvre was one of the outstanding portrait painters during the reign of King Louis XIV. He was born at Fontainebleau, where his father was one of the painters involved in the decoration of the palace. In his youth, Claude too worked there in the studio of Claude d’Hoey. He then moved to Paris where he studied with the most prominent painters of the day: Eustace Lesueur in 1654 and Charles Lebrun in 1655. It was Lebrun who encouraged Lefebvre to devote himself to portraiture. Lefebvre was admitted to the Académie Royale in 1663 and was named assistant professor the following year. He is thought to have travelled to England, where he appears to have absorbed lessons from the work of Van Dyck. His painted oeuvre has now become difficult to define, but his work had a reputation for magnificence and is known through prints made by the top reproductive engravers of the time, such as Edelinck and Van Schuppen. Lefebvre probably etched his self-portrait about the time he entered the Académie, around his 30th birthday. He made only three prints, but the self-portrait and the portrait of Boudan were superb–not so much for technical refinement as for their freedom of handling and their vivid likenesses. Comparison of the two prints quickly reveals Lefebvre’s probing artistic curiosity: the handling of the two faces is completely different. Whereas the Boudan is extensively and minutely stippled, Lefebvre delicately recreated his own image with tiny, lightly etched zig-zags and cross-hatchings that contrast with the bold lines used throughout the rest of the print. The moody, introspective Boudan averts his eyes; while, the dashing Lefebvre engages us directly. The two portraits can be compared to etchings by Van Dyck. 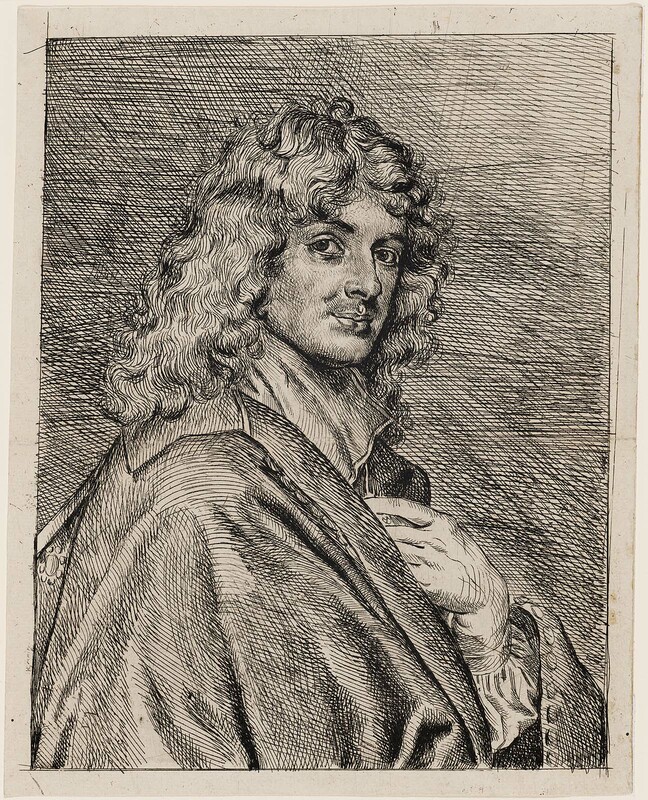 The Boudan follows the portraits published by Van Dyck in his Iconographie in both its format and inscriptions. The self-portrait recalls Van Dyck’s own in its informal presentation of a preening personality. The absence of inscriptions on Lefebvre’s self-portrait and its rarity suggests the possibility that he intended it as a personal memento for his friends and acquaintances. Maxime Préaud speculates that Lefebvre made his three prints as a means of recording his paintings. Whatever the case, one wishes that LeFebvre had developed his interest in etching in a larger oeuvre.